Annika just arrived from the Jacksonville Race Track. She was a very successful racer and raced more than 240 races. It is pretty unsual for a racer to continue racing well into their 5th year and she turned 5 on June 2nd. Annika was still running OK and making money for her trainer but they chose to go ahead and retire her so she could get her own family and couch. 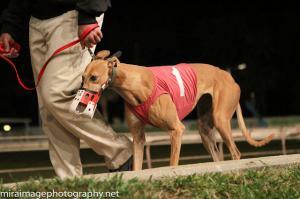 She is a beautiful muscular girl that is very short but stocky and raced at 58lbs. She is calm but very friendly and seems to have an excellent personality and is just gorgeous. Her sire is the famous Lonesome Cry and her dam is GS Gladice. Annika was a special order for one of our families that met her at the race track and has been waiting on her to retire so she may not actually be available for adoption. So far she has been very well behaved in her foster home and is very good with their baby and even guinea pigs.